Today's WWE Legends review features two classic wrestling heroes, The Bushwhackers, Luke & Butch! This duo best known to WWE fans for their comedic antics in and around the squared circle are part of the first series of WWE Legends two-packs exclusive to Toys R Us. Let's check them out! 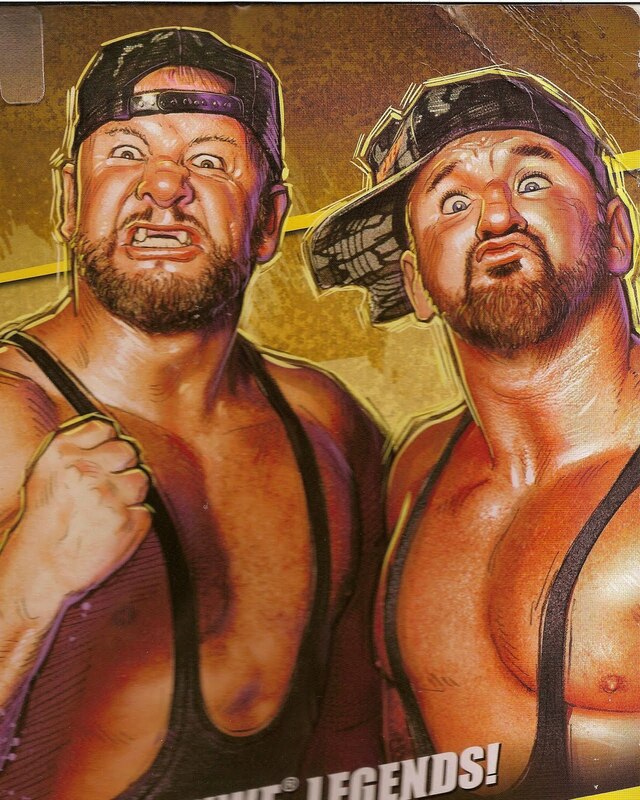 The Bushwhackers hailed from New Zealand and were primarily used as a solid, mid-card, comedy act during their time in the WWE. Part of their gimmick was coming to the ring while swinging their arms and stomping their feet in a wildly exaggerated manner. Also, they habitually licked each other's (and fans and sometimes opponents') heads. I'm not familiar with New Zealand customs, so I don't know what that's all about. But the kids loved it! Being that both 'whackers were roughly the same size, Mattel only sculpted one body to use on both figures. The body is, for the most part, 100% new in the WWE Legends line. The torso features a sculpted-on tank top with a raised edge. The lower body features a detailed sculpt of the 'Whackers' trademark camouflaged pants. There are pockets and wrinkles all over and the pants appear adequately baggy like they should. The one piece unique to each figure is the head. The likenesses are great and I love the facial expressions, especially on Luke. This is the only way to make these figures and I'm glad they did it. Bland expressions would just look like crap. If you were to remove the head on both figures, they only way to tell them apart is the tattoos. Each grappler has unique arm tattoos, Luke having several on both arms. While Mattel's done a great job on adding body art to their WWE figures, I'm a bit disappointed with the tattoos on these two. First the paint used seems too dark, something I've heard they've improved on in the latest waves of "Elite" figures. Also, the images aren't as sharp, but that may be caused by the choice in color. Obviously, they're just copying what the wrestlers have, but something didn't work out too well on these two. In spite of the new lower body's thicker, camo pants, the Bushwhackers managed to keep all the articulation points standard to the Legends/Elite line. All the points have great range of motion and don't suffer from any loose or excessively tight joints. As always double-hinged elbows would be a welcomed addition in this line and hopefully Mattel can get around to adding them before too long. The Bushwhackers include the standard WWE display base and "Legends" name tags, just in case you forget who they are. The name tags are still flimsy cardboard which will crease easily if you do not handle them with care. It can be tricky placing them in the display stand's slot as it's slightly curved. If you bend it too much, then you'll have a nasty crease in the tag, making it look like sh!t on your shelf. I'd prefer a larger base with a sticker unique to each Superstar/Team as opposed to the separate cardboard name tag. That would eliminate the fear of ruining the tag. Butch & Luke also include their trademark "Bushwhackers" caps, complete with chewed up bills and everything! They're made of a softer plastic and are essentially the same, save for the shape of the cap around the head. Butch's is molded to fit his head sideways, while Luke's is molded to wear straight forward or straight backward. The 'Whackers weren't known for carrying anything else, so these accessories are correct, albeit you can't help but feel a little short-changed. I will point out that they did require brand new bodies (minus the arms) and although the same body is used on both figures, it's still nicely sculpted and accurate. At $29.99, I don't know how long TRU will be able to move these off the shelves. I wouldn't say they're pegwarming because they haven't flooded my local stores with them yet, but they're not exactly flying off the pegs either. TRU & Mattel are targeting an older crowd with these and hopefully that's enough to keep the line going. I'm glad to add these guys to my Legends collection, but feel they'd be better priced at $22-25 for the pack. It probably won't ever happen, but if you see these collecting dust on the pegs, you may as well wait for a sale before jumping on them. Hive News: November is here!